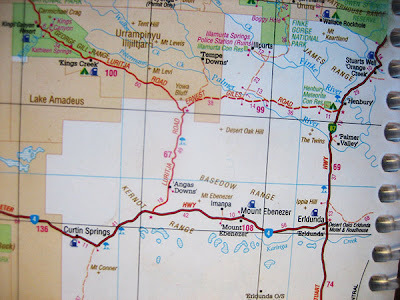 So, Blaine and I were looking at the map, and from the direction were going the only way to get to Kings Canyon (on a sealed road) was to travel about 250K out of the way, with a lot of backtracking. 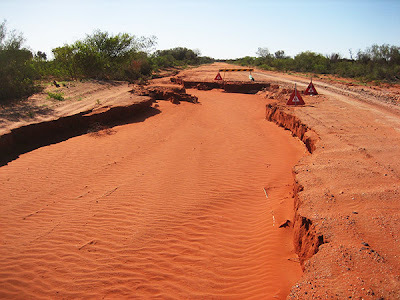 There is however a road that goes straight there… but it was closed 2 weeks ago due to rain and is 4x4 only. Well we decided to at least check it out. We talked to a girl at the info desk and she said it's 4x4, but other people had said we'd make it... so when we came up to the 4x4 road, we turned on just to see how bad it was. It didn’t look too bad, so we told ourselves if its gets too rough we’ll turn around. The road was 99K long and would cut off several hundred kilometers, therefore saving time and money. So we went for it. There were spots that were washed out by the rain and full of deep sand, but to avoid them, sometimes we could get off the road and drive through the bushes to avoid the super deep sand. 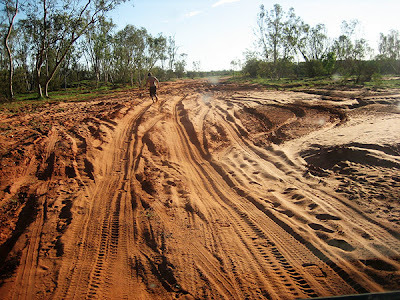 Blaine walked one of the side-routes several times to make sure it would be ok. Then we gunned it... As we were bobbing up and down, a 4x4 full of Aborigines passed us, just shaking their heads. (one of only two cars we saw the whole time... besides the stuck and abandoned ones!) Anyway, after a long time and a few more obstacles, we came to the big one, the mother of all washouts! After 98K's on the dirt/sand, we were literally 1K from the asphalt. You could almost taste it. We couldn’t turn back now! There was no alternate route and no way around the sand at all, so our only option was to go for it (or turn around and drive the 98K's back to the pavement, then drive another 250K's to get to where we were only 1K away from at that point). I wasn’t too worried because if we did get stuck, we were close to the road, so someone could pull us out. And if there is a person who could get a low clearance campervan through about 50 yards of deep sand and ruts, it would be Blaine! I got out of the van to watch. It was pretty funny watching that thing bob up and down like a teeter totter. We made it! The asphalt was very welcomed at that point, and we both felt very achieved for cutting 2 hours off the drive in scorching heat. Score one for the Chubby! Later we had talked to several people who said that when an Australian says the road is not passable except by 4x4 then you better heed it. This is not where the story ends. The following day we were simply turning around and we got stuck! How random is that, I mean right next to the pavement. If you think your mother approves of this type of erradic, lunitic behavior, you are wrong!